The Zbee three-wheeler electric vehicle is employing fibre reinforced plastic (FRP) body panels in combination with two Scott Bader structural adhesives: Crestabond® M1-05 and Crestomer® Advantage 30, selected for their combination of light weight adhesive jointing, build quality and productivity. 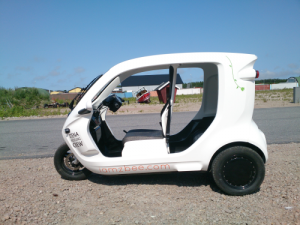 The Zbee is an ultra-light, energy efficient electric vehicle, designed by Clean Motion AB, located in Lerum Sweden with its manufacturing site in Trollhättan. It is compact with dimensions of only 240cm long by 120cm wide and 150cm high, and has a curb weight of just 230kg. The overall design makes it agile in traffic and easy to park; up to four Zbees can fit in a typical single parking space. Being powered by a 4KW electric motor, it has zero emissions and no engine noise. Clean Motion developed the Zbee as a compact electric city vehicle for short distance urban transportation for up to three people. It has a maximum speed of 50km/h and a range of 45 km (~20 miles) on a single charge. The battery recharges in three hours. Scott Bader adds that Crestabond M1-05 and Crestomer Advantage 30 were specified by Clean Motion because they are proven structural adhesives with reliable long term bond strength performance combined with toughness and durability due to their high elongation and impact strength properties. Only a single bonded joint, with no mechanical fixings, was specified for joining the FRP body sections together to minimise weight. The fibreglass body panels were supplied by HJ Kompositmontering AB, the approved local FRP body parts subcontractor in Sweden for Clean Motion. Crestabond M1-05, which is a grey coloured adhesive, is used to bond FRP body sections together, and also for bonding aluminium profiles located in the boot of the car. Scott Bader says that high productivity can be achieved because Crestabond is a primer-less adhesive, needing little if any surface preparation. It also offers rapid cure and a short fixture time of 12-18 minutes. Crestomer Advantage 30, which is coloured white, is used on all the visible FRP-FRP joints in order to provide a combination of a pleasing aesthetic finish to the Zbee’s GRP body with reliable build quality. Both manual and pneumatic handguns are used by HJ Kompositmontering AB during production of the FRP body parts, depending on the specific bonding application.